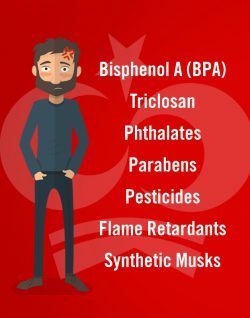 Many synthetic chemicals have been linked to health problems, but have you heard of Endocrine Disrupting Chemicals (EDCs), found in household products? The evidence against EDCs is mounting up. A large amount of scientific data now strongly suggests that exposure to EDCs increase our vulnerability to cancer. These chemicals are believed to be causing long-term, sometimes irreversible damage to our health and environment. Watch the video to find out more about EDCs, and how to protect yourself and your family from common household products that contain them. From food packaging to dental filings, plastics are now everywhere. Most will contain BPA and Phthalates. How? Say no to plastic food containers, and bottles marked PET or PETE. Also avoid PVC and tinned foods, as tin cans often contain BPA in the lining. Pay attention especially to plastics marked with the No.7 in recycling arrows, as well as No.6 and No.3. Bear in mind that white dental filings and lenses can also contain BPA. The word ‘fragrance’ or ‘parfum’ on a label means Phthalates and/or Synthetic Musks. Both can be found in everything from nail-varnish to aftershave. These are often bio-accumulative and sometimes carcinogenic. Other EDCs found in cosmetics are Parabens, used as preservatives, and Triclosan, which often exits in toothpastes and hand-washes for anti-bacterial purposes. How? When buying cosmetics, creams, shampoos and the like, opt for fragrance-free products. Look out for Triclosan, Microban and Parabens on labels. Choose perfumes made of essential oils, and natural cosmetics with as little ingredients and preservatives as possible. When cleaning, many of us actually pollute the air in our homes with harsh chemicals containing Synthetic Musks and Phthalates. Often it’s impossible to know what harmful EDCs your cleaning products contain because manufacturers aren’t required to list them. How? Avoid air-fresheners and other synthetic smelling cleaning products and washing up liquids. Opt for fabric softeners and detergents that are fragrance free. You can also make your own cleaning products using natural household ingredients like vinegar and bicarbonate of soda. The most obvious suspects are often the hardest to spot. Linked to hormone disruption, Pesticides are part and parcel of industrial farming, leaving residues in our food and showing up in water through field run-off. How? Eating Organic is the best option. If your budget is too tight, try to buy foods that are grown conventionally, with the least amount of processing. Opt for whole fruit & veg instead of pre-sliced/washed, and avoid packaging where possible. The same applies to meat: a whole fish or chicken is better than nuggets and fish fingers. Also watch out for EDCs, which hide in non-stick pots and pans. Cook with steel or cast iron instead. Flame Retardant chemicals are used to add fire proofing to furniture, carpets, paints and electronics. Many manufacturers continue to use these despite their link to cancer. These chemicals escape from household products to accumulate in the dust in your home. How? Dust often (with a damp cloth) and vacuum regularly. A vacuum cleaner with a HEPA filter is most effective at trapping dust, along with the EDCs and other harmful chemicals that accumulate in it.